ADORABLE: Mom turns 9-month-old daughter into "Elf on the Shelf"
Mom turns 9-month-old daughter into "Elf on the Shelf." SAN DIEGO, CA (KTRK) -- It's an adorable transformation that has the world "ooo-ing" and "ahh-ing." A California mom has turned her 9-month-old daughter into "The Elf on the Shelf" for the holiday season. Gabbi Cope, 22, shared the photos of her daughter on Facebook. "When your child is too young to understand Elf on the Shelf you make her 'Esme on the Shelf' and spread Christmas cheer to her and everyone else!!" she posted. "We thought dressing her up as 'Esme on the Shelf' would spread that light and cheer with others," Cope told ABC News. Some of the scenarios "Esme" has found herself in: being entangled in Christmas lights, eating spaghetti straight from a bowl and caught in a sack race challenge. "My favorite is probably the spaghetti and syrup picture," Cope wrote. "It was so much fun to photograph and even more fun watching her literally stuff her face with food." Her recent moment is probably the most relaxing of all and a common necessity for a 9-month-old: sleep. 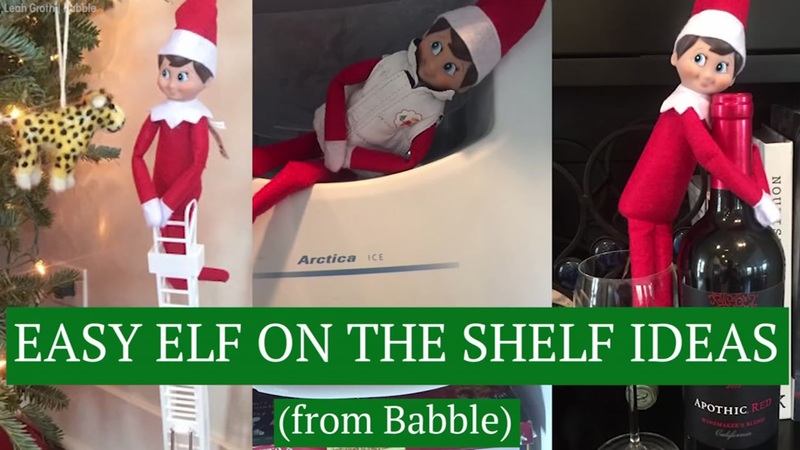 Here's some easy, funny places where you can put your "Elf on the Shelf."